During the build and rigging, as they work on the boat doing all of the special things that make a Skater a pinnacle that other top of the line builders try their best to emulate, one can’t help but wonder why perfection is their only goal. It is always interesting to watch a project being assembled piece by piece. Never any corner cutting, not a hint of “Good Enough”, and no pretense of anything but the pursuit of perfection will keep the Skater team happy. As we watch different performance boats being built and sent out from the Skater facility, we can’t help but be amazed at the different levels of “Custom” Peter and his team is willing to put out the door. 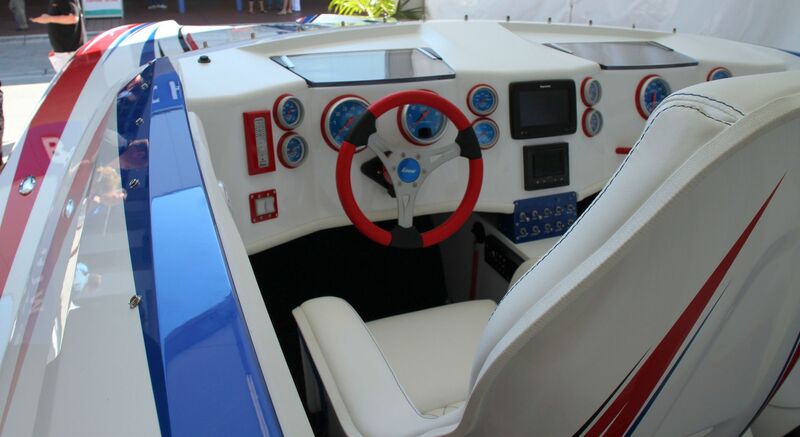 This particular boat, a gorgeous red, white, and blue piece of All American performance with black highlights, has quite a few little tweaks to make it a one of a kind special. Steering on the left side of the boat, with throttles ready for Jim’s right hand, is one of those “Custom” modifications that just make you say “huh”. When I was chatting with Jim to find out why, he said he was right handed and was absolutely the most comfortable, and confident, throttling with his right hand. As a right hander also, makes sense to me! While watching the interior being installed, as they were getting the boat’s last few items completed to leave for the Miami show, it was obvious once again why Skater has the reputation they do among performance boat enthusiasts. There they were at the last minute and time to leave, but a minor issue with the two front-seat’s main cushions popped up when they went to install them. So, back to the upholsterer they go, fix them correctly, bring them back and install them. Then it was okay to button up and leave for the show, just a bit later than had been planned. In the snow outside the Skater facility waiting for the final wrap and tow to Miami. A bit warmer here in Miami, I wonder if that makes boats happier? Everyone says a boat has a personality like a woman, so I’m thinking it must be a lot happier. I know my wife was while there in Miami versus here in the snow! It would be cool to have in Hawaii?